Just passing through? Need a short break? Norton Canes has a motorway services on its doorstep. The services are located on the M6 Toll between JT6 and JT7. 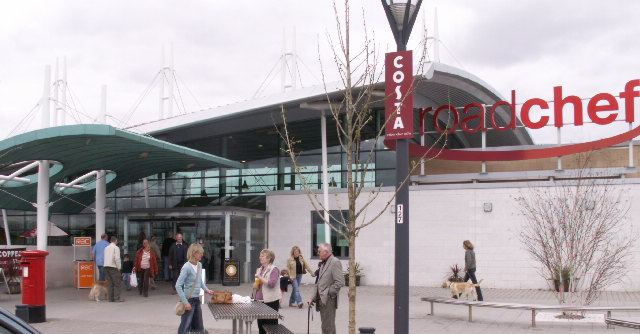 Located off its own unnumbered junction, Norton Canes is one of the newest motorway services in the UK. It’s very popular and very busy, and is well landscaped, with fountains and picnic benches located around it. First two hours free for all vehicles, after which cars must pay £10 and HGVs, caravans and coaches £18, or £20 to include a £10 food voucher. Prices are paid using PayByPhone – more details or in the shop or restaurant. The location code is 5263. One of Roadchef’s most profitable sites, Norton Canes is quite possibly the only service area where traffic from the local area and A5 road can come in and park up in a separate car park. Normally such things are possible but illegal. The food is served in a new ‘cook to order’ and ‘proper’ style, taking 10 minutes to cook and pleasing the BBC’s ‘The Money Programme’, but it costed nearly £50 to feed a family of four! It also featured in their ‘Top Gear’ in 2004. The site occupies 68 acres, and it opened on the 9th March 2004, a few months after the motorway itself. When it opened it was described as “a new era in services”. The parking areas can accommodate 350 cars, 52 lorries, 25 coaches and 6 caravans, in addition to a 110-space overflow car park (which is used much more than you’d think, see the photos). The services were first proposed in 1993 as part of the toll road project and were initially rejected by the council on environmental grounds and because the plans were put forward before the M6 Toll had been finalised. In August 2011, Visit England rated the services as 4 stars. For information and offers for the RoadChef Norton Canes services, you can visit the website by clicking here (external website).